On a very high heat, fry 500g of beef mince in batches until very browned. Remove to a bowl. Fry 1 large chopped white onion until soft then add 4 cloves of garlic and a finely diced red pepper. Now add the mince back to the pan along with 1 tsp dried oregano, cinnamon, cumin, smoked paprika, salt, sugar and 1 tsp each of as many chilli powders as you like (I added 4) and a dash of Worcestershire sauce and combine. Next add a tin of chopped tomatoes and half a litre of beef stock. Stir well to combine. Add kidney beans if you like but it isn’t necessary. You can also add extra chilli sauces here such as habanero sauce. Cook for around 30 mins on simmer with a lid on. Finally, you can add chopped coriander and a squeeze of lime before serving. 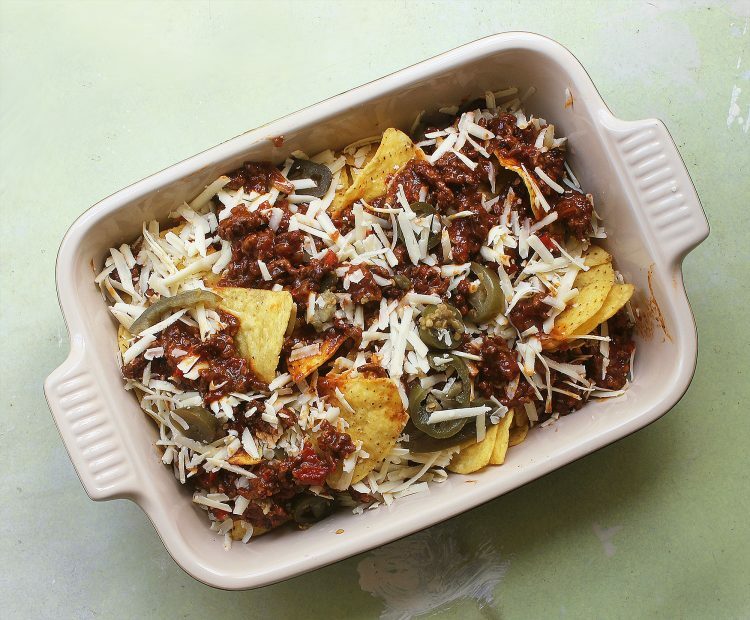 Serve over nachos with cheddar cheese and sour cream.